Plexidor Pet Doors: Can cats improve the news? Many people in Japan are fascinated with cats, and the country is home to innumerable cat cafes where people can watch and interact with cats. Seen from that perspective, it makes sense that a cat would help with the newscasts as well. American shorthair cat Maago might not read the news or actively comment on events, but the mere presence of the kitty lightens up the news. Shuukan News Shinsho is a weekly show that coves serious issues such as trade, wars, and politics. Guests are remarkably unfazed by Maago licking the desk or tasting their tea. While some viewers surely tune in to spot the cat - he sometimes wanders off camera and reappears much later - he also fills an important function, making difficult news easier to bear. Everything is better with a cat. To read more about Maago and see more images, visit kotaku.com. 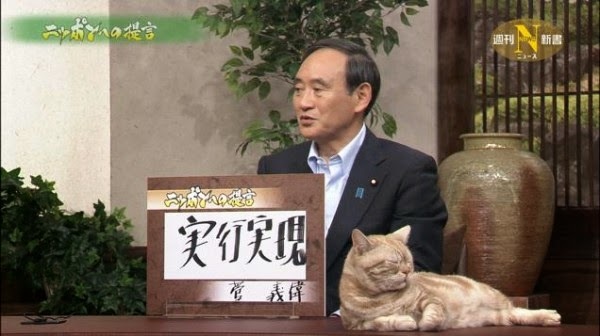 Would you watch a news program with a cat? Do you think a cat is the ideal TV show companion, or can you think of an even better pet? That is funny! Mom is not surprised! She spent a lot of time in Japan when she was a flight attendant, did not really like it there, but was always amused by the odd things they do in their culture. This would be another odd one.